SUMMER SIZZLES with SAINTESS LARNIA – Celebrating the Artists of SUMMER! – 2 PM SLT on 27 July! – Ce Soir Arts – Be inspired tonight! 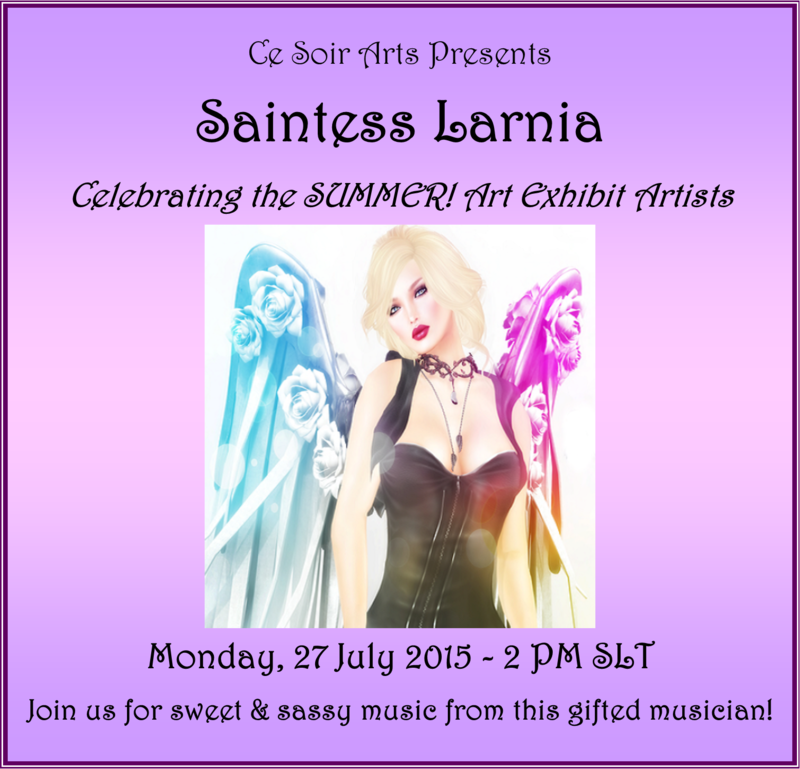 SUMMER SIZZLES with SAINTESS LARNIA – Celebrating the Artists of SUMMER! – 2 PM SLT on 27 July! Celebrate SUMMER with fantastic music from the charming and talented SAINTESS! Join us as she provides a sizzling soundrack for the SUMMER! exhibit featuring the work of thirteen outstanding artists, capturing the heat and energy of the season! Known for her hip originals and well-chosen covers, Saintess fills the hall with a voice both sultry and sweet. Her sound will get you dancing! She has played Ce Soir many times, and we are always happy to see her on the stage; SAINTESS brings an amazing range of music, presenting it all in her special style that is at once edgy and soothing. Don’t miss it! 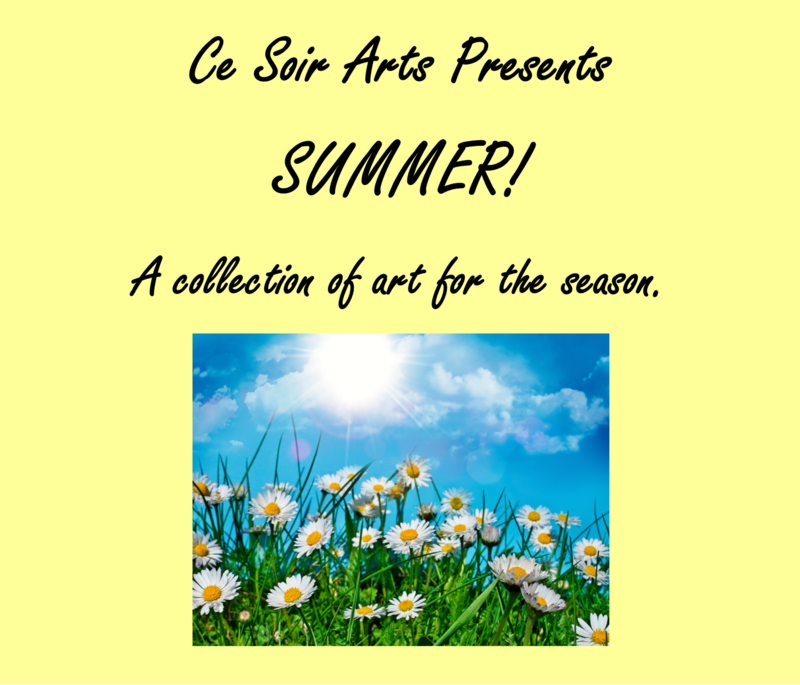 SUMMER SIZZLES at Ce Soir Arts! Come also to enjoy the work of Xirana Oximoxi, Aelin Quan, Owen Landar, Fuschia Nightfire, Indea Vaher, Secret Rage, Sparkie Cyberstar, Russell Eponym, Liam Saxony, Christie Spad, Rhea Choral, Jewell Wirefly, and Mireille Jenvieve. Each one brings something special to their work and our experience of art in SL. Information about each artist’s work is provided, and you can be sure you will enjoy wandering about the Gallery and Lawn, taking in their impressions of the season! Note an earlier post for details about each artist and their stunning contributions to the life of ART in SL! Fun and glorious music and art await! Come…be inspired tonight! Next Ce Soir Arts Hosts Six of SL’s Finest Musicians for Stand Up 2 Cancer of SL 2015!